Are you looking for a webcam cover that fits nicely in a closed laptop? We believe you shouldn’t have to choose between privacy and being able to close your laptop all the way. 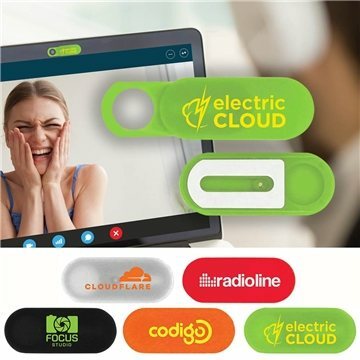 The Ultra Thin Webcam Cover, from AnyPromo, is a sliding webcam cover with a very slim profile. This two-piece webcam cover made of ABS plastic not only protects you from being spied on through your webcam, it fits better in closed laptops than other covers. Webcam covers make a great giveaway for anyone who uses a laptop. Whether you’re promoting cyber-security or simply want to give away something useful, this is a perfect tech giveaway for branding. Every time the user opens their laptop, they’ll see your pad printed or full color logo on the webcam cover. Always feel secure with our two-piece webcam cover. Simply slide the cover to expose or cover your webcam lens. Constructed of ABS plastic. Adhere to your computer screen to attach.